Chile’s Atacama desert provides some of the best natural conditions in the world for solar power. Long periods of horizontal solar irradiation create great natural conditions for solar power in Atacama, which ultimately translates into lower cost of generating solar energy. Chile has supplemented the favorable natural conditions for solar power with encouraging market conditions for utility-scale solar projects, which has resulted in explosive growth of Chile’s solar market. As the price of solar modules continues to drop globally, the combined result of these fertile natural and market conditions continue to yield remarkable results for the Chilean solar market. Chile now possesses the largest photovoltaic plant in Latin America with the 100 MW Amanecer solar plant in the Atacama desert. The Sun Edison built Amanecer plant became operational this June, and only represent the first of a series of solar project in Atacama. Chile currently has over 400 MW of solar projects under construction with an additional 700 MW of projects already approved for financing. Furthermore, Chile has accomplished this scale of financing for solar projects without governmental subsidies. The main customer for for the solar-generated electricity are the Chilean national utilities. The power demand from the Chilean utilities has instilled confidence in international investors and solar manufacturers, who have been rushing to the new opportunities in the Chilean solar market. The success of the Sun Edison-built Amanecer plant has further increased the confidence of the manufacturers, since the project represented the first major solar project outside the traditional solar markets. Amanecer is currently the largest solar plant in Latin America, but a new plant in Atacama may soon strip Amanecer of its current title. The Luz Del Norte plant is a 141 MW solar project in the Atacama desert currently being built by First Solar, which began construction of the Luz Del Norte Plants this October, after final rounds of financing were secured in July. 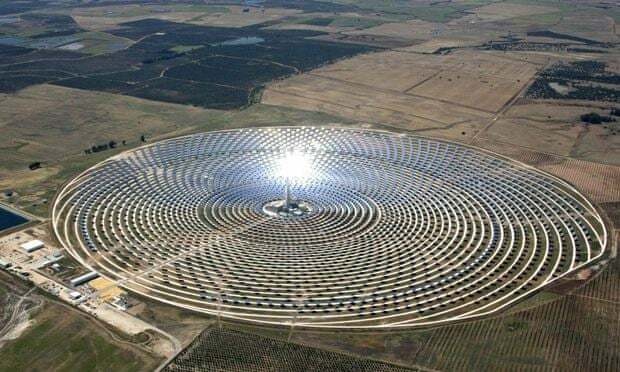 Even though Chile has already experienced tremendous success with photovoltaic utility-scale projects, new solar projects are offering a different approach with concentrating solar power (CSP) technology. CSP technology uses the heat of concentrated solar irradiation to boil water into steam. The steam then turns a turbine to generate electricity, as described further in this article. CSP systems have an inherent energy storage mechanism that makes solar power available 24 hours a day. This is a significant advantage over photovoltaic modules that only generate electricity during sunlight hours and whose power has to be used instantly. The main disadvantage of CSP plants is large space requirements, which are not a significant issue given the nature of the Atacama desert. Chile’s dazzling Atacama solar projects have the potential to fuel the increasing energy demands of the growing northern economy, and might even provide energy to the Chilean capital of Santiago. If successful, the Atacama projects could provide a model for how Latin American countries can integrate solar power into their energy mix. Well this part about producing electricity 24 hours in solar power plants is something new for me, and a great news for us and planet earth. Great article.